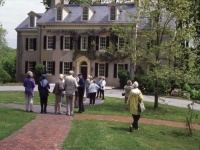 The Hagley Museum and Library collects, preserves and interprets the history of American enterprise and is a non-profit educational institution. With a range of exhibitions, guided tours, walking trails and demonstrations, there is so much to learn at the Hagley Museum. Visitors can experience 19th-century living on Workers' Hill, visit the Powder Yard, where massive stone mills, storehouses, and a waterwheel echo a time when water was the main source of energy, and tour the Eleutherian Mills, a mansion that has been home to five generations of the famous du Pont family and features breath-taking views over the Brandywine Valley.